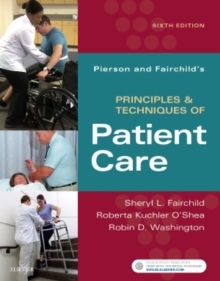 Master the basics of rehab patient care with Pierson and Fairchild's Principles & Techniques of Patient Care, 6th Edition. This proven text not only provides clear "how-to" information on everything from positioning and draping to patient transfers and ambulation activities, but it also includes easy-to-understand rationales explaining the "why" behind these proven techniques. This new edition has been thoroughly updated to reflect the most current accepted patient care standards, principles, and techniques. Plus, additional video clips and expanded learning resources will help ensure you have a solid mastery of patient care in the rehabilitation setting. Content based on the World Health Organization's ICF model (International Classification of Functioning, Disability, and Health) - the model currently endorsed by the APTA and AOTA - ensures you are referencing information that stems from the most current theories and practice guidelines of physical and occupational therapy. Insights into the rationales and physiological principles explain why specific techniques and procedures are used. More than 800 full color photographs clearly demonstrate proper performance of techniques and procedures used in the assessment and management of patients in the rehabilitation setting. Guidelines, principles, and precautions boxes throughout the text offer additional tips for optimal assessment and management of patients in the rehabilitation setting. Self-study and problem solving (case study) activities conclude each chapter to help you understand important concepts and improve your decision-making and problem solving skills. Video clips on companion Evolve website demonstrate the techniques and procedures described in the text. Content on professionalism and the concept of professional values and ethics reinforce existing workplace guidelines and how to apply those guidelines to your patient interactions. Online user resources on the companion Evolve website feature video clips and additional activities for you to hone your skills. (What additional activities?)NEW! Procedures index lists all of the procedures covered in the text to help you quickly locate procedure descriptions while working in the clinical setting. NEW! Additional video clips demonstrate patient transfers, ambulation with aids, donning and doffing PPE, and maneuvering a wheelchair. NEW! Video clip table of contents lists over 30 video clips in the front matter of the text.